The ATS Triple M4 Mag Shingle is designed to securely hold three individual M4 mags in a flat configuration that is preferable to double or triple magazine pouches when going to the prone position. It features an open top design with adjustable shock cord retention straps. These straps securely hold your loaded mags in place and allow you to quickly and quietly remove them when they are needed. ATS M4-style pouches are all sized on the PMAG, so fitting all quality 30 round M4 magazines is no problem. 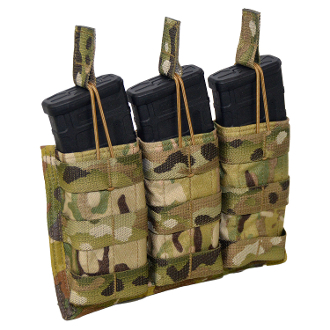 The pouch has three rows of MOLLE compatible webbing on the front (3 rows and 2 channels per cell) allowing you to stack two panels on top of each other or to add other modular pouches on top of it, such as a pistol magazine or multi-tool pouch. This gives you the flexibility to "layer" pouches. Though not originally part of the design, the user can also use one of the mag slots to carry a pistol with light attached. It attaches to any MOLLE compatible platform using our L-Strap attachment system. The Triple M4 Mag Shingle measures about 9 ½ inches tall by about 6 inches wide and about 1 ½ inches deep. It takes 6 channels and 6 rows of MOLLE space.